Boundary sections are extremely important in helping to discern the nature of events at the boundaries between one geological time period and another. Where the boundary sections mark significant changes in the biosphere, as they frequently do (as with extinction events, for example), they often contain important clues as to nature and causes of those changes. They can tell how rapidly extinction events took place, what kinds of organisms were affected, and what geological and geochemical changes may have influenced the ecological conditions of the time. Understanding the relation of one group of rocks to another is one of the most important tasks of geologists. Back in the early part of the nineteenth century, it was the English mining geologist William Smith (1769-1839) who first realized that rocks in one area contained the same fossils as rocks in areas far distant. Using his knowledge of these rocks and their constituent fossils, Smith was able to trace rock formations -- similar rocks that had been deposited originally as sediment in ancient oceans -- over large distances across the English countryside. Smith's work revolutionized our understanding of the Earth. To identify which rocks were deposited during which geological time period, it is necessary to employ some system of markers that provide precise information as to the identity of the rocks. A major volcanic eruption, for example, can drop ash far from its source. Because the ash is deposited at about the same time (geologically speaking) everywhere, it provides a specific time marker that can be used for rocks everywhere that the ash fell. When the ash deposit is found in one place, those rocks can be correlated in time with rocks elsewhere containing the same ash. Fossils were Smith's time markers, and they continue to be the most important of the geological time markers. Marine fossils are, by far, the most important of these indicators (called index fossils). That is because, with rare exceptions, the world ocean has always been one continuous body, allowing the free and often geologically rapid movement of organisms from place to place therein. A radiolarian that is found off the California coast, for example, may well be found off the coasts of Japan, Chile, Indonesia, India, Mozambique, Nigeria, Brazil, and France -- indeed, all around the world. This is in stark contrast to land organisms, whose distribution is generally limited to particular continents, or only small areas within the continents. Lions are confined to parts of Africa, for example, and coastal redwoods to the coast of northern California. The distribution of terrestrial organisms is too limited (provincial) to make their bones potentially good index fossils. Small, plentiful, and geographically widespread (cosmopolitan) marine organisms thus provide the best index fossils. Because sedimentary rocks -- usually of marine origin -- cover 75% of the surface of the continents, these marine index fossils are frequently found on land, and can be highly useful for temporal correlation. Boundaries in time, it should be noted, are not dissimilar from political boundaries. When one wanders from one state or county to another, there may be clear natural barriers like rivers, or there may be little difference in appearance. In the latter case, only the road signs may notify the traveler that s/he has passed from one place into another. The thickness of the political boundary itself is infinitely thin; it is only the states or counties on either side which have dimension. This is also true for boundaries in time, which are measured in rocks. (One difference between political boundaries and boundaries in geological time is that a political boundary is horizontal, but geological boundaries may be stacked up in a vertical rock face.) The underlying (usually older) rocks may look identical to the overlying (usually younger) rocks, and typically there are no signs to indicate that one group of rocks is different from an adjacent one. (One interesting exception is in north central Wyoming, where Route 20 cuts through the Owl Creek Mountains along the Wind River between the Boysen Reservoir Dam and Thermopolis. There roadsigns actually specify the various ages of the rock.) On the other hand, there may be pronounced differences in the rocks at either side of the boundary. Although geologists need to decide where to place geological time boundaries -- and the precise placement of the Permian-Triassic boundary has been in dispute for more than a hundred years (Wignall and Twitchett, 2002) -- they also need often to understand what happened on either side of the boundary. Therefore they study what is called the boundary section: the section of rock that spans the boundary, including both the "before" and "after." Where there has been a mass extinction, understanding the boundary section is essential. Because the rocks of different boundary sections reflect differing oceanic or terrestrial settings (such as ocean depth or polar versus tropical conditions), boundary sections can provide numerous sources of data. They can, moreover, provide glimpses of conditions both before and after boundary events (though boundaries do record gradual transitions as well as the abrupt changes referred to as events). Though boundary sections may include other types of rocks, such as lava flows or volcanic ash (extremely useful for providing precise geologic dating), the most useful rocks to scientists are sedimentary, because sediment usually accumulates quite slowly, it can record many tiny increments of geological time. In addition, sedimentary rocks often incorporate important fossil and geochemical evidence, such as isotope trends. It used to be thought that there were few regions in the world that had rock sequences spanning the Permian-Triassic boundary (PTB). These rock sequences are found in east Greenland, around the north and east of the Mediterranean, central Asia, south Africa, and south China. Many of these purported sections, however, have been the subjects of disputes over whether they actually mark the boundary, and, if so, exactly where the boundary is and how complete the section is. The most serious challenges concern the sequences in Greenland and around the Mediterranean, where suggested boundary sections stretch from Italy to Israel, and include sites in Hungary, the former Yugoslavia, Greece, and Turkey (Erwin, 1993). The Italian section, for example, may contain a gap of unknown length, due either to a lack of sedimentation or to erosion. Such a gap, obviously, may conceal important information as to the cause, extent, and nature of the extinction event. Hence the caution of geologists and paleontologists about boundary sections which may be incomplete. But the Italian section nonetheless does contain some significant evidence: it records a major increase in the fossilized spores of fungi (Visscher and Brugman, 1988). This fungal spike is one of a number of such boundary spikes which tell of a world overrun with fungi, which live off dead plant matter. Thus while the actual Permian-Triassic boundary may be absent, the Italian section bears clear testimony to the catastrophe that ended the Permian and to the nature of the world which immediately followed. The Permian-Triassic boundary sections are present around the Mediterranean because what is now the Mediterranean was, 250 million years ago, the western end of the Tethys Ocean. [MAP!] Marine sequences from the Tethys are consequently now found in some Mediterranean regions. Similarly, central Asian regions also possess Permian-Triassic boundary sections from the Tethys Ocean, though many of them have gaps and are also disputed. These sections stretch from present-day Armenia as far as Nepal, and include sites in Iran, Pakistan, and India. 250 million years ago, these areas were in the southern Tethys, some of them being part of the extended string of large islands that constituted the Cimmerian continent, others being on the northern edge of India. In the ensuing tens of millions of years, these land masses and their associated continental margins and marine sediments moved north across the Tethys, and eventually collided with Asia. Looking at a geological map of present-day China [MAP! ], one is struck by the large area of exposed Permian rocks, many of them from the Late Permian. It is the rocks not far (about 150 km, or 100 miles, southwest) from the city of Shanghai, however, which have drawn the particular attention of scientists. In northern Zhejiang Province, near the city of Changxing, is the Meishan coalfield. The coal at Meishan is bituminous, or soft coal; the overburden -- the rock overlying the coal -- is the youngest (that is, most recent) major Permian rock formation anywhere in the world. And on top of that is rock from the earliest (that is, oldest) Triassic. The rock is primarily limestone, with layers of clay and chert, and was laid down at the edge of a shallow sea (Yang and Jiang, 1981; Yang and Li, 1992). Layers of volcanic ash confirm that there was significant explosive, subduction-related volcanism in or near South China during this time. In addition to these regions, two major additional Permian-Triassic boundary sections have provided important new information in recent years. One is in South Africa, where the Karroo (sometimes spelled Karoo) Basin, which was the subject of considerable study from the 1890s well into the early twentieth century, has been the subject of new investigations. This area contains large numbers of Permian and Triassic terrestrial vertebrates, as well as clues to the environmental changes which occurred at the P-T boundary. The other is in Japan, where several boundary sections exist in the southwest of the main island, Honshu. Located in the area of the city of Inuyama, which is about a third of the way between Japan's old capital, Kyoto, and Tokyo, two of the sections examined lie well-exposed along the banks of the Kiso River. These sections, though now on land, are composed of rocks from the deep ocean. They are bedded radiolarian cherts, similar to the cherts that make up the spectacular (but much younger) red-brown folded beds of the Marin Headlands, just north and west of the Golden Gate Bridge (see below). They are comprised of the skeletons of radiolaria, single-celled organisms which build their skeletons from silica (SiO¸2; glass), colored red because of hematite, iron oxide. These skeletons accumulate as sediments on the ocean floor, and over the ages are compacted and harden into layers (beds) of chert. The Marin Headlands. These ancient chert beds (from 100 to 200 million years ago) were originally on the bottom of the ocean. Tiny microorganisms known as radiolaria lived and died in the ancient ocean, and their skeletons slowly accumulated on the seafloor. These chert beds probably represent millions of years of such accumulation. Eventually they hardened into rock, and were pushed up against the North American continent, where they became part of the California coast. The wavy, contorted shape of these chert beds is a clear indication of the enormous forces involved in pushing these rocks onshore. How then do these cherts get from the deep seafloor to their places on land in Marin County and in southwest Japan? The fate of all oceanic tectonic plates, it should be recalled, is that they are subducted back into the Earth at active margins. But as the process of subduction proceeds, much of the sedimentary cover and even parts of the underlying seafloor are scraped off by the tectonic plate which is overriding the ocean plate. This debris accumulates in huge masses called accretionary complexes (or accretionary wedges) in which the seafloor mud and rocks are churned about and their geological information scrambled. But occasionally a large rock mass -- one which may be several kilometers (a few miles) long and one or two hundred meters (yards) thick (Isozaki, 1994) -- is carried intact onto the land. This process, labeled obduction, is rare, but the information conveyed to geologists by these rock masses is invaluable. In the case of the obducted rocks in southwest Japan, that information is about deep ocean conditions before, during, and after the Permian-Triassic boundary. The Japanese boundary sections record the condition of Panthalassa during that time. The cherts which are lowermost in the sections are an intense red. Like the cherts on the Marin Headlands, they reveal that the deep ocean in Late Permian times was well-oxygenated, because the red color comes from hematite: like rust, an oxide of iron. Approaching the boundary, however, the beds lose their color and become gray, and then the amount of silica drops. The cherts are replaced by a light gray siliceous claystone; these, in turn, give way to a jet black carbonaceous claystone, that is, black shale (Isozaki, 1994). The fact that the Japanese boundary rocks are claystones, therefore, indicates that they were formed far offshore, in the deep ocean. The chert provides corroborating evidence: it is only far from land that the slow rain of tiny siliceous skeletons can dominate sediment composition. Nearer to land, sediments washed from the continents are much more plentiful, and are the dominant constituents of the seafloor sediments. The red chert to gray chert to gray claystone to black shale progression marks a descent from highly oxic conditions to severe and protracted anoxia. First the bright red-brown color of the chert was lost as the amount of oxygen dissolved in the seawater decreased. Then the silica component of the rocks dropped as the radiolarian population declined. The final stage in the process was the widespread death of aerobic organisms in the water column, recorded in the high carbon content of the lowermost black shales. The descent into anoxia is confirmed by two other lines of evidence. First, the claystones are well laminated (Isozaki, 1994). Such thin beds could have only existed in the absence of disturbance by bioturbators, the worms, mollusks, and other aerobic organisms which live in seafloor burrows and/or make their livings mining the sediments for minute prey and organic debris. Without oxygen, these organisms die, and ocean bottom sediments remain undisturbed. Second, the gray and black claystones contain iron pyrite (FeS¸2, iron sulfide) and completely lack hematite (Isozaki, 1994). Pyrite ("fool's gold") is an indicator of anoxic conditions, because when oxygen is present, iron forms oxides (such as hematite), or combines with both sulfur and oxygen to form sulfates. Lacking oxygen, the iron simply combines with hydrogen sulfide to produce iron sulfide. This process is facilitated by the so-called sulfate-reducing organisms, which strip oxygen from sulfates (to use as an energy source) and dump hydrogen sulfide as a waste product. Deep ocean anoxia continued for a considerable period of time. Indeed, because this anoxia was so severe, protracted, and unlike other oceanic anoxic events, it has been labeled "superanoxia" (Isozaki, 1994). Nonetheless, after some long time (possibly millions of years), the anoxia began to dissipate. The jet black carbonaceous claystone, the black shale, gave way to more light gray siliceous claystone, and then to gray-black chert. Eventually oxygen returned to the deep waters, and the deposition of hematite-stained red chert resumed (Isozaki, 1994). The gray and black chert and claystones take up from 40 to 50 meters (yards) of the Japanese boundary sections. It has been estimated that this represents about eight million years of deep sea sedimentation. If terrigenous sedimentation were more rapid than usual during this interval (and there is some reason to believe it was), the time could have been shorter. But sedimentation rates are difficult to estimate, and the gray and black chert and claystone deposition easily could have taken longer. In any case, it is clear that this episode of deep sea anoxia stretched for several millions of years, and perhaps for over ten million years. The anoxia recorded in the Japanese rocks from the deep sea has also been observed in rocks from shallow-water environments (Holser, 1989; Wignall and Hallam, 1992). Clearly, end-Permian oceanic anoxia was extensive throughout the world ocean. It seems likely that only very limited areas of the ocean -- perhaps in the cold water of the southern ocean, if even there, or in an embayment on the Tethyan coast of Gondwana (Wignall and Twitchett, 2002, Fig. 10) -- may have escaped the anoxia that characterized most of the ocean of 250 million years ago. Exactly where the exact Permian-Triassic boundary is in this boundary section has been the subject of ongoing dispute. Yukio Isozaki, who has probably studied the Japanese boundary sections more than any other scientist, originally placed the actual boundary about midway in the black claystone unit (Isozaki, 1994, Figure 3). This would suggest that the anoxic episode began many millions of years before the boundary. Part of the difficulty in assessing just where the boundary is located is the consequence of the extreme nature of the end-Permian extinction itself. To determine where in a rock sequence the boundaries of particular time periods are to be found, paleontologists carefully select and employ what are called index fossils. Index fossils are the remains of organisms which were widely distributed (and therefore almost universally fossils of marine rather than terrestrial organisms), plentiful, and, if possible, easy to identify. Using them, paleontologists and geologists are able to make age determinations of ancient rocks, and correlate them with other ancient rocks over vast distances. But the biological devastation caused at the end of the Permian has made selecting appropriate index fossils difficult, and locating them in unfamiliar rocks, where they are often rare, problematic. The few fossils found in the Japanese boundary section do, in fact, confirm that it is the Permian-Triassic boundary, but have not been useful in establishing its precise location. Isozaki (2001) now believes that the actual boundary must lie within the black claystone unit, because the index fossils found below come from Permian organisms, while those fossils found above are Triassic. But because that unit possesses only poorly-preserved microfossils, the exact boundary location cannot be determined. Furthermore, in boundary sections elsewhere, the carbon isotope excursion has helped pinpoint the exact boundary, but carbonate rocks and skeletons are not present in sections from deep water because carbonate dissolves with increased pressure. The Japanese sections apparently were originally in water too deep to retain carbonate. This inability to determine the exact placement of the boundary has limited the amount of useful information such sections can provide. Not surprisingly, therefore, the utility of these sections for understanding the nature of the end-Permian extinction has been challenged (as by Becker, 2001b, and Retallack and Holser, 1997). However, the Japanese sections do convey information which is essential in understanding the nature of the end-Permian extinction. They clearly establish that severe and quite protracted deep water anoxia accompanied and followed the extinction, and numerous scientists believe that this anoxia was the consequence of events at the end of the Permian. Though Isozaki (1997a) believed that the anoxia could have been due to long-term ocean stratification, he nonetheless acknowledged, "The apparent oceanic stratification may have been a consequence, rather than a cause, of all the unique changes across the boundary." In addition, Isozaki recognized that the carbonaceous claystone, the black shale, was probably not the result of a "one-time mass dying" at the Permian's end. Though this would have been a catastrophic event, the dying could not have continued for millions of years. Instead, Isozaki suggested (1997b) that the black shale probably records a "transient blooming of anaerobic bacteria during the 'superanoxia.'" Transient, that is, but lasting for the length of the deep water superanoxia: perhaps as long as eight to ten million years. There are five leading theories that attempt to explain what happened at the end of the Permian. There are numerous other theories (such as global cooling; see Stanley, 1987) and "sub-theories," which modify the main theories. But the main theories are those which have attracted the most attention from scientists. These are: the impactor (bolide) theory, the volcanism theory, the regression theory, the oceanic overturn theory, and the methane catastrophe theory. The impactor theory is, of course, inspired by the success of the Alvarez's explanation for the end-Cretaceous catastrophe. Clearly the impact from this asteroid or comet caused an extraordinary catastrophe for many organisms. Obviously, according to impactor advocates, an even larger impactor would have the energy to do even greater damage to the biosphere. With many large objects (both asteroids and comets) meandering around and through the inner solar system, there are plenty of potential impactors. Consequently, the impactor theory has had a strong appeal and needs to be examined seriously. The problem with the impactor proposal, however, is that there has been no evidence to support it. There is no iridium layer, as found at the Cretaceous-Tertiary boundary. There is no accepted evidence for shocked quartz, though some have claimed to have found such, but the quality of their specimens has been unconvincing. There are no microtektites -- or the clay spherules which the microtektites by now would have weathered into. (Spherules from the Emeishan volcanic episode [258 to 254 million years ago; Xu, 2004] in the South China area have been found, but obviously these have nothing to do with any alleged impact.) There are no tsunami deposits that record a great impact in the ocean. No impact crater has been located. Unfortunately, the theory's strong appeal has led some to believe that there is -- or must be -- evidence. One geological chart actually indicates the size of the impactor that the chart's designers (without evidence) knew must have caused the end-Permian extinction. In another case, an impact structure (the Woodleigh structure) in Western Australia seemed to be about the right size and age to have produced the extinction (Mory, 2000a, challenged by Reimold and Koeberl, 2000), but further research revealed that the structure is at least 100 million years too old (Mory, 2000b). A icy comet, composed in large part (and conveniently!) of isotopically light carbon has also been suggested as a possible cause of the extinction and the carbon isotopic excursion at the Permian-Triassic boundary (Bowring, 1998). However, despite the huge size that such an impactor would have had to have been -- much, much larger than the impactor at the K-T boundary -- all other evidence of this deus ex machina (or rather, saxum -- rock -- ex machina) has disappeared. The suggestion therefore fails a basic test of modern scientific theory: it must be falsifiable, and is not. The most recent attempt to attribute the end-Permian extinction to an extraterrestrial impact began in early 2001 with the publication of an article in Science. In this article, Luann Becker and her co-authors indicated that their analysis of ratio of Helium-3 (^3He) to the far more common Helium-4 (^4He) isotopes in rocks found at the Permian-Triassic boundary section in Meishan, China revealed evidence of an extraterrestrial impact. Becker and her colleagues found the anomalous ratios in helium gas trapped within all-carbon spherical structures known as fullerenes, or, more colloquially, as buckyballs. These tiny (molecular size) spheres, which resemble the geodesic domes invented by architect Buckminster Fuller -- hence the names fullerene and buckyball -- are cages which can enclose and entrap gases, and are extremely stable over long periods of time. Fullerenes, presumably of extraterrestrial origin, have even been found in the 1.85 billion-year-old Sudbury impact crater in Canada (Becker, 1994). Thus fullerenes may constitute the ultimate time capsule. But because fullerenes are nonetheless quite small, they can only enclose tiny quantities of gases, which require extremely careful laboratory techniques to extract. Terrestrial rocks tend to have low ^3He to ^4He ratios because the lighter isotope of helium can more easily escape Earth's gravity. Therefore the higher isotopic ratio identified by Becker and her colleagues argues that the host fullerene and its gases had an extraterrestrial origin. Becker's proposal found support from Kunio Kaiho and his co-workers in an article that appeared in a 2001 issue of Geology. In the rocks of the Meishan, China, Permian-Triassic boundary section, they discovered iron-silicon-nickel (Fe-Si-Ni) grains, which they indicated can only be created in the extremely high temperatures generated by an impact. They also found a significant increase in the lighter isotope of sulfur (in geochemical terms, this is a negative excursion of d^34S). Kaiho and co-workers attributed this sulfur excursion to a massive release of isotopically light sulfur from Earth's mantle (just below the crust, and therefore from 0 to 70 km -- 0 to about 40 miles -- deep), caused when the impactor (they favored one of much greater size than Becker's group) penetrated the crust. This sulfur would have rapidly been oxidized, drawing down atmospheric oxygen and producing widespread and devastating sulfuric acid rain (Kaiho, 2001). But in September of 2001, Becker's results were challenged in a letter to Science by Kenneth Farley and Sujoy Mukhopadhyay of the California Institute of Technology. Farley and Mukhopadhyay found no fullerenes in the Meishan PTB section rock specimens they sampled. Lacking fullerenes that they could put a test, the Cal Tech researchers used whole rock samples. In other words, they used ground-up specimens of whole rocks (rather than their alleged constituent fullerenes) to test for the purported helium anomaly. In these specimens, the ^3He concentrations they obtained were significantly more depleted (lower in ^3He, by a factor of from 45 to 150 times lower) than Becker and her associates had found in the fullerenes. Unable to locate any 3He-containing fullerenes, Farley and Mukhopadhyay concluded that there was no evidence for an impact such as had been reported by Becker and co-authors (Farley and Mukhopadhyay, 2001). Becker and her co-author Poreda responded that the analytic procedures employed by Farley and Mukhopadhyay were not the same as they themselves had used, nor were Farley and Mukhopadhyay's specimens from the exact same site as the material they had analyzed. Further, according to Becker and Poreda, by using bulk rock rather than fullerenes, Farley and Mukhopadhyay had contaminated their analysis. Becker and Poreda indicated that they had re-run their experiments, confirming their results, and stated that they were submitting samples to two independent labs for further examination (Becker and Poreda, 2001). Eager to learn the results from the independent laboratory analyses, I carefully watched the Technical Comment section of Science for many ensuing months. Nothing appeared. At last I tried to contact Becker via e-mail, but received no response. I presumed this was the consequence of her having been working, within a short period of time, at several different institutions. Some months later, with possibly better e-mail addresses, I tried again, but again received no response. Then I tried contacting Becker's co-author, Poreda, at the University of Rochester. I received no response from Poreda either. As a last resort, I contacted Ken Farley at Cal Tech, figuring that although he was in no way responsible for the independent analyses promised by Becker and Poreda, he might know when those results might be published. The reply I received was short and to the point: "I have no idea. I wouldn't hold my breath if I were you." I am no longer expecting either a response from Becker or Poreda, or that any report on the independent analyses will appear in Science. The second theory regarding the cause of the end-Permian catastrophe is the volcanism theory. Unlike the impactor theory, the volcanism theory starts with extraordinarily good evidence. The Siberian Traps eruptive event was probably the second largest of the Phanerozoic. Once Paul Renne and his co-workers (1995) had established that the end of the Permian and the Traps eruptive sequence were essentially synchronous, there should have been little doubt that Traps volcanism was somehow involved with the end-Permian catastrophe. It is surprising, therefore, that a few subsequent major scientific articles ignored or minimized the importance of Traps volcanism (Becker, 2001; Knoll, 1996; Bowring, 1998). This is a bit like ignoring the proverbial 500 pound gorilla standing in one's path. Traps volcanism must have played some role -- and likely an important one -- in the end-Permian catastrophe. There have been continuing suggestions that Traps volcanism could have been triggered by an impact (for example, Kaiho, 2002a). Again, this is not an unreasonable proposal. Impactors do have extraordinary destructive power, as shown by that of the Cretaceous-Tertiary (K-T) boundary. Despite the power of the K-T impact, however, there was no associated volcanism. Some have argued that the volcanism of the Deccan Traps -- a massive outpouring of basalt which created a large igneous province (LIP) in northwestern India -- was caused by the energy of the impact being focused at the exact opposite (antipodal) point on the Earth's surface from the Chicxulub impact in Mexico's Yucatan Peninsula, triggering the eruption. But we do have a good sense of where both the Yucatan and northwest India were at the end of the Cretaceous, and northwest India, though on the other side of the planet, was not antipodal to the Yucatan. In addition, there is the matter of timing. It appears that the Chicxulub impact and Deccan Traps volcanism were temporally separated by about a half million years -- with the Deccan Traps volcanism coming first (Kamo, 2003; Ravizza and Peucker-Ehrenbrink, 2003)! The cause (impact) and effect (massive volcanism) scenario simply does not hold up. As to the general question of whether an impact can trigger volcanism, the issue has been addressed numerous times by Jay Melosh and his various co-workers, and the answer has always been no (Melosh, 2000; Melosh, 2001; Ivanov and Melosh, 2003). Moreover, Melosh makes one quite compelling argument against impact-induced volcanism: if it happens, where's the evidence? Of the well-over 100 impact structures that have been identified on Earth, none have impact-associated volcanism. Surely, Melosh argues, if impacts can generate volcanic eruptions, there ought to be at least a few that exhibit lava and/or ash flows as a consequence. None does. If an impact did cause the Siberian Traps volcanism, and then that caused the end-Permian extinction, it is a unique occurrence in the Phanerozoic. But ultimately, the question of whether an impact produced the Siberian Traps volcanism does not seem to be of importance. Here's why. Numerous other flood basalts happened with no such trigger, so an impact trigger for the Siberian Traps eruption is not a necessity. The Traps could have erupted -- and most likely did erupt -- without such assistance. Moreover, there do not appear to be any effects from this purported impact-triggered volcanism that cannot be explained without it. Other causes (such as volcanism coupled with seafloor methane release) seem all that are needed to account for the devastation that occurred 250 million years ago. Lacking evidence for the suggested impact, and lacking any effects that can be specifically attributed to it, impact-induced volcanism seems an unlikely cause of the end-Permian extinction. Siberian Traps volcanism itself, however, was undoubtedly greatly involved in the end-Permian catastrophe. The very synchroneity of Traps volcanism with the end of the Permian makes what in law is referred to as a prima facie case. Without investigating further, that is, it would seem that such a colossal eruptive sequence must have been associated, in some way, with the contemporaneous extinction. When the actual effects of that volcanism are examined, a compelling case can be made for Traps involvement in the end-Permian catastrophe. Whether the Traps eruption alone can fully account for all the climatological, biological, and other changes observed at the Permian-Triassic boundary, though, is another matter. Though there is some variation in exactly how Traps volcanism could have produced the end-Permian extinction, the basic argument is a simple one. The Traps volcanism is the greatest of the Phanerozoic, the past 543 million years. Moreover, the Traps eruptions took place in an extremely short period of time, at least for an eruptive sequence so voluminous. They are likely to have occurred in less than a million years, and according to some estimates, less than 600,000 years. In addition, in contrast to other flood basalt events, a significant portion (perhaps 20%) of the Traps volcanism was in the form of pyroclastic eruptions. Ash would have suffocated those animals that inhaled too much, or could have caused them silicosis -- a deadly lung disease -- or lung cancer if they survived the initial ashfalls. Filter-feeding marine organisms in the near-polar regions would have been decimated by having their filters clogged. The stomata (gas exchange pores) of terrestrial plants may have been less affected because stomata are generally on the underside of leaves, where they are less likely to experience clogging. Ash-covered plants, however, would have suffered from both the reduction of photosynthesis and limb-breakage, compromising their energy budgets and making them more vulnerable to insects and disease. The cooling produced by the dimming of incoming solar radiation would also have adversely affected large numbers of organisms on the short-term. This cooling would have been greatly magnified by the formation of sulfate aerosols from the sulfur dioxide (SO¸2) gas expelled by the eruptions. (The cooling would not, however, have been nearly great enough or long enough to have caused a short-lived ice age, as has been suggested by Campbell, 1992.) Sulfate aerosols would have caused additional regional and perhaps hemispheric cooling for months to years. These aerosols, like the volcanic ash, remain in the atmosphere on a short (one to three year) time scale. (The ability of sulfate and other aerosols to remain in the atmosphere, however, is greatly dependent on the altitude to which they have been injected. Aerosols in the troposphere, the lowest part of the atmosphere, which is responsible for precipitation, quickly get rained out, or fall to earth in about a week [Karl and Trenberth, 2003]. Those aerosols lofted to the upper troposphere, or to the stratosphere can remain suspended for longer periods, up to several years.) Sulfurous gases would have suffocated nearby air-breathers. Because sulfur dioxide would have reacted chemically to produce sulfuric acid, highly acidic rain would have fallen over a wide region. (The chemical reactions are: 2SO¸2 + O¸2 Æ 2SO¸3, and then SO¸3 + H¸2O Æ H¸2SO¸4.) In all, possibly trillions of metric tons (each roughly equivalent to an English ton) of sulfur compounds would have been ejected into the atmosphere during the course of the eruptions. An even larger amount of carbon dioxide (CO¸2) would also have been expelled by Traps volcanism. But in contrast to the sulfate aerosols, carbon dioxide remains in the atmosphere for extended periods of time (centuries), though it decreases slowly over that interval. As a greenhouse gas, it warms the atmosphere, changing ecological conditions. (Deccan Traps volcanism, coming before the end of the Cretaceous, is estimated to have warmed the world by 3° to 5°C, or 5.4° to 9°F; Ravizza and Peucker-Ehrenbrink, 2003.) And because it combines chemically to form carbonic acid, it also produces mildly acidic rain. Acid rain can dissolve calcium carbonate shells, particularly those at or near the ocean surface. Additionally, acid rain leaches vital nutrients from the soil, resulting in plant stunting and death. Fish and many other aquatic organisms are quite intolerant of changes in the acidity of the water they live in. Perhaps the clearest example of just how sensitive these organisms are comes from several decades ago, when the (sulfuric and nitric) acid rain caused by unregulated sulfur and nitrogen oxide emissions from Midwestern factories killed all of the fish in hundreds of freshwater lakes in New York's Adirondack Mountains, more than a thousand kilometers (more than 600 miles) away. Water vapor is not toxic, but it too is a significant greenhouse gas. Volcanoes typically emit a huge quantity of water vapor, far more than any other gas. Some 80 to 90% of the gaseous emissions of volcanoes is water vapor. In the large quantities expelled by the Traps volcanism, it would have helped warm the atmosphere. A warmer atmosphere would have held still more water, and precipitation would have increased. Finally, the Traps eruption would have released significant quantities of halogen gases. Halogen gases -- fluorine, chlorine, and bromine -- are particularly caustic and reactive chemically. Both hydrogen fluoride and hydrogen chloride would have been released; both form powerful acids. Chlorine and bromine are also released in eruptions; they have a considerable ability to destroy ozone. Any reduction of the ozone layer allows more ultraviolet light through the atmosphere. For terrestrial organisms and those near the surface of the ocean, tissue damage, genetic mutations, and cancer can ensue. Many of the effects of Traps volcanism would have been shaped by the timing of the eruptive sequence. Like the eruptions of the familiar cone-shaped stratovolcanoes (Mount Saint Helens, Mount Pinatubo, Mount Fuji) and the Hawaiian shield (shaped) volcanoes, flood basalt eruptions occur as pulses of activity followed by periods of dormancy. The stepped structure of the Traps themselves reflects the pulsed character of the volcanic events, with the various steps indicative of eruptive episodes. The vast area covered by Traps ash and basalt flows, together with the difficulties involved in dating particular eruptive episodes, probably makes disentangling the exact sequence of activity impossible, though the patterns of pyroclastic and basalt flow intervals may provide some insight into the course of the eruption. Because each eruptive pulse had both short-term (abrupt cooling over a period of a few years) and long-term (warming beginning shortly after the event but lasting for centuries) consequences, the precise pattern of warming and cooling will remain unknown. Cooling was likely the first result of an eruptive pulse, though its effect would have been muted if the pulse was close in time to its predecessor and greenhouse gases still warmed the atmosphere. The general long-term warming and the abrupt cooling episodes, together with the occasional rapid change in temperatures, would have caused mortality to many temperature-sensitive organisms. Nonetheless, the effect of Traps volcanism would have been constrained by atmospheric circulation patterns. Because these patterns (called cells) tend to be regional, they can limit volcanic effects. The ash lofted by Traps volcanism, therefore, would have gone around the world, but would have been somewhat restricted to the far northern latitudes of the Traps themselves, with movement south and particularly into the southern hemisphere being limited. Thus while small quantities of ash would have made their way to all parts of the world, most of the ash would have fallen quite locally. But while most ash, being composed of particles, would have fallen out regionally, the gases emitted in the Traps eruptions would have had more general circulation and consequences. The more chemically active gases, like chlorine and bromine, would have caused their damage to the ozone layer and to living tissue on a relatively short-term basis, but carbon dioxide would have remained in the atmosphere over a much longer period, keeping global temperatures above normal for centuries after each major eruptive pulse. As with the current anthropogenic warming of the planet, this warming would have been greatest near the poles. Because carbon dioxide, whatever its source, is rapidly mixed in the atmosphere, the location of the source has little to do with polar warming. But there are other consequences that ensue from the particular location of the Traps. Although scientists have given considerable attention to the possible effects of the Siberian Traps eruptions, discussion of the special consequences of these eruptions in the far north has been strangely neglected. These consequences are not trivial. Near the poles, as a consequence of the cold, methane hydrates and their underlying free gas lie closer to the seafloor surface, and can be more readily released. It was a similarly high northernly location, after all, from which seafloor methane was released by volcanism during the formation of the North Atlantic Igneous Province (NAIP) at the onset of the Late Paleocene Thermal Maximum. Furthermore, because of the colder temperatures at high latitudes, the altitude of the stratosphere (the second lowest layer of the atmosphere) is lower than elsewhere, and it is easier to inject with ash and sulfate aerosols. The ash and aerosols cannot be rained out of the stratosphere because they are above the weather, which is largely confined to the atmosphere's lowest layer, the troposphere. These aerosols eventually do fall out of the atmosphere, but the finest particles may be fairly widely distributed throughout the affected hemisphere when they do. Ashfalls would have darkened northern sea ice and winter snow, causing melting and decreasing the reflectivity (albedo) of the polar region. More solar energy would have been absorbed, raising regional and at least hemispheric temperatures. In addition, the direct heating of the Siberian area and adjacent polar waters would also have helped melt sea ice and winter snow, and would have decreased albedo. Usually polar waters are not only frigid but also highly saline, because the sea ice freezing process excludes salt. Thus sea ice contains fresh water, while polar seawater is quite saline. The melting of polar sea ice would therefore have had a significant impact on global thermohaline circulation (for a discussion of thermohaline circulation, see APPENDIX 3: THERMOHALINE CIRCULATION). Instead of dense cold and saline water emanating from the northern polar region, and dropping to the ocean floor, this warmer and fresher meltwater would have remained at the surface, causing oceanic stagnation. Tropical water made highly saline and therefore dense by evaporation (salt does not evaporate, and so gets left behind) would have dropped to the ocean floor. Warm water carries less dissolved oxygen than does cold water, and the warmer the water, the less oxygen it carries. With warmer and more saline water in the deep parts of the ocean, the bottom of the ocean would have become dysoxic (low in oxygen). With normal thermohaline circulation, the ocean floor is well ventilated (high in oxygen). Most aerobic organisms are highly intolerant of changes in the oxygen content of the medium they live in, whether it be air or water. It seems likely that the viability of ocean bottom dwelling organisms would have been severely compromised by the diminished level of dissolved oxygen. Organisms at or near the ocean surface may have been less affected, but warmer and fresher waters in the north polar region may also have taken their toll. In a warmer world, evaporation would be greater, and, with salt being left behind in the ocean as water evaporates, tropical water would have become still more dense. It is even possible that the major changes in the density of polar water (becoming less dense) and tropical water (becoming more dense), could have temporarily reversed global thermohaline circulation. In this reversed flow, labeled "halothermal" circulation (Horne, 1999), tropical water, having dropped to the ocean floor, moves poleward, while the less dense polar water moves along the surface towards the equator. If this did indeed transpire, the circulation of Panthalassa would have been particularly complex, as ocean water in the southern polar regions would not have been as affected as that of the north. Warming spread out over many centuries would have been the longer-term consequence of each episode of Traps volcanism. Decreased albedo and greenhouse gases would have led to hemispheric warming and eventually warming on a global scale. In addition, the direct (from hot lava flows and ashfalls) and indirect (from decreased albedo and greenhouse gases) heating by Traps volcanism would have released large quantities of hydrate methane from both the northern regional permafrost and nearby continental margins. The methane demon would have been loosed from the bottle. The significant and protracted episodes of Traps volcanism would have had numerous harmful effects, particularly in the Arctic and perhaps mid-latitude northern regions as well. It is unlikely, however, that it was directly responsible for most of the biological devastation at the end of the Permian. Many of the Traps effects would have been limited to the local area, although some may have been hemispheric or global in their reach. Another volcanic event of the Phanerozoic that is roughly comparable in magnitude to the Siberian Traps volcanism -- the Deccan Traps eruption in India at about 66 million years ago -- cannot be linked to similar catastrophic consequences despite great efforts by its supporters. After all, the Deccan Traps volcanism came half a million years or so too early to explain the demise of the dinosaurs and the many other organisms that perished at the end of the Cretaceous. The volcanism theory also fails to explain one major piece of evidence from the Permian-Triassic boundary, that of the significant negative carbon isotope excursion. The boundary records a significant increase in the lighter isotope of carbon (^12C) relative to its heavier isotope (^13C). Carbon isotope values plunged, and remained low for millions of years. "Global occurrence of such highly depleted carbon isotopic values in Earth's history is rare. The only other time in Earth's history when d^13C values as low as the ones in...Early Triassic paleosols are detected globally was during the Precambrian (Hayes, 1983; Hayes, 1994; Holland, 1997)" (Krull and Retallack, 2000). Volcanic gases are simply not sufficiently depleted in the heavier isotope of carbon (Dickens, 1995; Bowring, 1998; Jahren, 2001) to explain the excursion. Carbon dioxide from volcanic magma has a d^13C of about ­8 per mil, in contrast to hydrate methane's depletion of about ­60 per mil. There is simply no way that the addition of volcanically-depleted carbon to the atmosphere-ocean system can account for Early Triassic paleosol (fossil soil) excursion values of about ­42 per mil (Krull and Retallack, 2000). Only the addition of carbon with d^13C values well below ­42 per mil can do so, and that requires the presence, in large quantities, of dissociated hydrate methane or the free gas that lies below it. As Dickens (1995) pointed out in regard to the events at the end of the Paleocene (55 million years ago), "simple mass balance equations" rule out any other possibility than that such carbon isotope excursions are caused by the injection of substantial amounts of methane into the ocean and atmosphere. Volcanic carbon dioxide simply cannot do the trick. Consequently, "the eruption of the Siberian Traps is at best only a partial explanation of the observations" (Bowring, 1998). This theory enjoyed some support about a decade ago, but that support seems to have waned. The basic idea is that the end-Permian extinction was caused by a major drop (regression) in global sea level. This regression may have as great as 280 meters (more than 900 feet; see, for example, Campbell, 1992), though others suggest it was far less, though nonetheless a significant regression: "The [Permian-Triassic boundary] is marked by an extreme low stand of the sea relative to the land platform, some 50 m below the zero datum" (Ross and Ross, 1987; Haq, 1988, from Veevers, 1994). There may be some support for this proposal in the brief subaerial (under the air, that is, not underwater) exposures of Permian-Triassic boundary reefs in southwest China (Erwin, 1993, p. 72), but such subaerial exposures may also be the result of local uplift caused by magmatic intrusion or subduction-related processes. Perhaps the main proponent of the centrality of regression as a cause of the end-Permian extinction was Doug Erwin (1993). He declared that "It seems reasonably clear that the explanation of the extinction must involve the [Late Permian] regression..." (Erwin, 1993, p. 255). Erwin picked up on a proposal by Paull (1991) that a significant regression, caused by the formation of continental ice sheets during an ice age and thereby removing water from the planet's oceans, could trigger the release of hydrate methane by the depressurization of hydrate buried in continental margins. Erwin, however, traced the alleged Late Permian regression not to continental ice sheet formation, but to sea level changes that accompanied the assembly of Pangea. As the pieces of Pangea came together in collisions between supercontinents and with other large landmasses, mountain ranges were created and the average elevation of the megacontinent rose. This was accompanied by changes in the roundness (called the geoid) of the planet, changes that were relatively minor in comparison with its generally spherical shape, but which would have affected sea level. Further, there was decline in plate tectonic activity, which would have resulted in a cooling and contraction of the rocks of the ocean floor, deepening the ocean basins, and allowing global sea level to fall (Erwin, 1993). However, although there is evidence for a higher average elevation for Pangea than for today's continents, there is no good evidence for Permian changes in the geoid or for the reduction of plate tectonic activity. An alternative proposal is that the regression was triggered by the Siberian Traps volcanism. Because volcanic eruptions produce large quantities of cooling sulfate aerosols, the titanic eruptions of the Siberian Traps could have produced a major though transient ice age, according to the theory's proponents. A significant quantity of ocean water would have been transferred (by evaporation and then precipitation as snow) to huge continental ice sheets, according to the scenario. This would have lowered global sea level. According to the regression proposal, marine extinction could have resulted from two consequences of sea level fall. Those marine organisms which live on the continental shelves, or which live in the water above them, would have faced rapidly changing and usually more adverse conditions as the water receded and they were forced into new environments lower on the continental shelves. Ecological conditions further out on the shelves are more homogeneous than those close to shore, where coastline variability and the action of rivers and tides create distinct local environments. In addition, as water recedes from the coast, there is less shelf left for organisms to live in and on. Organisms would have faced greatly increased competition in the remaining living space, causing mass mortality. Reefs and reef organisms certainly would have been decimated. In addition, the vast amounts of carbon (from organic debris and the remains of dead organisms) in the continental shelf sediments would have been oxidized, raising the level of atmospheric carbon dioxide and producing global warming. (The carbon dioxide produced by the oxidation of this organic carbon would have caused a moderate negative carbon isotope shift.) This warming, in turn, would have caused the demise of many additional marine organisms, and would have had a considerable impact on terrestrial organisms as well. In his version of the regression scenario, Erwin (1993) also focused attention on the consequences of regression for the composition of the atmosphere and for the chemistry of the oceans. (Erwin did insist that "the extinction cannot be traced to a single cause, but rather a multiplicity of events occurring together, in particular the increased climatic and ecological instability associated with the regression and a combination of greenhouse warming and possible oceanic anoxia from increased atmospheric CO¸2"; 1993, p. 256. His Figure 9.4, however, clearly shows the centrality of regression in his scenario.) Regression, he noted, would have permitted the oxidation of the vast amounts of carbon in the continental shelves, as those shelves became exposed to the air. Furthermore, as in the Paull proposal, hydrate methane from permafrost and within the continental margins would also have been released, and quickly oxidized to carbon dioxide. According to Erwin, "This triggered global warming and perhaps an increase in ocean anoxia" (1993, p. 256). There are two main difficulties with the regression scenario. First, the evidence for the purported regression has been challenged, as some have found that the "Permian-Triassic (P-Tr) boundary straddles an interval of rapid, global sea-level rise" (Wignall and Twitchett, 1996; see also Wignall and Hallam, 1992; Wignall and Hallam, 1993; Beauchamp and Baud, 2002). Others have indicated that there may only be evidence for a minor early Triassic transgression. Thus, exactly what was happening with global sea level before and at the Permian-Triassic boundary is still unresolved. Second, conclusions about what was happening with global sea level are, in any case, notoriously difficult to make, especially when significant changes (more than 100 meters/yards) may happen over very short periods of time (thousands of years), as at the ends of ice ages. Evidence for a regression caused by a slowing of sea floor rifting, for example, could just as easily have been produced by tectonically active continental margins. At these margins, the subduction of ocean floor beneath a continent pushes up the edge of the continent. This raises the elevation of the continent relative to the sea, giving the impression that sea level has dropped. (Earthquakes associated with the subducting ocean floor can cause the sudden sinking of the same coast, yielding the opposite effect.) Because much of Pangea was surrounded by such active margins, the contribution of the active margins to any observed regression could have been considerable. In order to distinguish this effect from others, one would have to know such things as when a particular margin became active, and whether the rate of subduction had been changing. This difficulty becomes even more problematic when one considers that a regression caused by a decline in sea floor rifting is actually a simple case, and that other possibilities may be significantly more complex. Take the end-Permian ice age suggestion. Indeed, the sequestering of a considerable amount of water in continental ice would have certainly lowered sea level. But continental areas covered by heavy ice sheets would have been pushed down by their weight. The level of sea would therefore have risen on the continental margins where a heavy burden of continental ice lay nearby. In these areas, there would be indications of transgression (sea level rise) rather than for regression. In areas distant from such ice sheets, there would have been the opposite effect. As ocean water moved up the edges of continents weighed down by ice, that water would have had to drain from the shores of other continents. Thus transgression could have been occurring in one area while regression was happening elsewhere. At the end of the proposed ice age, these sea level changes would have been reversed. As continents which had been formerly covered with ice rebounded, they would have experienced regression, while areas elsewhere would have been having transgression. Obviously, the proper measurement of sea level is a complicated task, and knowledge of the specific conditions where measurement is being taken is indispensable. Knowledge of these specific conditions -- including whether and when a particular continental margin was active, and whether an area was close to or far distant from a continental ice sheet -- is quite difficult to obtain, particularly at a quarter of a billion years remove. The Siberian Traps volcanism adds another complication. As the great blob of magma that was to become the Traps eruption moved upwards toward the Siberian surface, it would have caused an enormous bulge, perhaps half a kilometer (three-tenths of a mile) or more in height in the middle, over an area possibly 2000 kilometers (1200 miles) across. (Renne, 1995, suggests an uplift of the affected area of Siberia by about 10 to 50 meters [yards], whereas Coffin and Eldholm, 1994, Figure 8A indicates that uplift could have been about half a kilometer. The latter seems the more realistic estimate, though a calculation of the estimated volume of the Traps magma divided by the estimated area over which the Traps lava was erupted suggests that even Coffin and Eldholm's projection may have been too low, and that the actual uplift could have been as much as a kilometer [six-tenths of a mile].) The then Siberian coast would have experienced a tremendous regression as water drained from the rising continent. The water would have had to go somewhere, however, so other continents would have had substantial transgressions. Once the Traps erupted, the situation would have been reversed. Under the weight of the flood basalts, Siberia would have been pushed down, and the ensuing transgression there would have been matched by regression elsewhere. The following table provides a compact compilation of all of these transgression-regression cycles. There are numerous arguments against a regression-caused end-Permian extinction. Three are general objections, the others are specific to the suggestion that the purported regression was caused by continental ice sheets. First, of course, is that the sea level record from 250 million years ago is sufficiently unclear and lacking in specificity to make a clear determination about any global or local effects it may have had. Second, because the recent Ice Age (that of the last million and a half years or so) had a similar effect on sea level (several regressions of about 100 to 125 meters: roughly, yards) to that of the purported end-Permian regression (even if that regression had another cause than the proliferation of continental ice sheets), there should have been a similar serious disruption of the marine and terrestrial ecology. There is no evidence of such a disruption. Third, as with the recent Ice Age, previous Phanerozoic ice ages should have also been accompanied by major extinctions, including, most notably, by at the start of the great Carboniferous-Permian ice age. No such extinction has been identified. Similarly, if the purported regression was indeed caused by global cooling by Siberian Traps generated aerosols, confirmatory evidence is missing. There are no dropstones that would have fallen from the bottoms of glaciers as they reached the oceans, no continental rocks polished by the grinding passage of continental ice sheets, no moraines of the proper age left behind by mountain glaciers. The greatest difficulty with the ice age-induced regression proposal, however, is that sulfate aerosol-produced cooling is remarkably short-lived. Sulfate aerosols only remain in the atmosphere for a few years at most before precipitating out. This short a time period is hardly sufficient to produce an ice age, however transient: severe short-term cold, yes, but not great continental ice sheets. Even if there were extended pulses of eruptions punctuating hundreds of thousands of years of Traps volcanism, this would not have been sufficient to cause an ice age, because while sulfate aerosols precipitate out in a one-to three-year period, another volcanic product, carbon dioxide, would have been accumulating in the atmosphere. Instead of global cooling, extended volcanism produces global warming, and that warming begins shortly after an eruption. The amount of warming, of course, depends on the amount of carbon dioxide pumped into the atmosphere. Despite the difficulties in obtaining evidence regarding exactly what was happening with sea level precisely at the Permian-Triassic boundary, it does seem that there should at least have been Siberian Traps-related sea level changes: first a great regression in the Siberian area and a transgression elsewhere as the magma plume rose under the continent, then a great transgression in the Siberia area and regression elsewhere as that magma erupted and weighed down the continent. This may be the cause of the evidence for the most rapid transgression of the Phanerozoic in the Early Triassic (Holser and Magaritz, 1997). Could such sea level changes have caused the extinction? It seems unlikely. After all, the Earth has experienced similar sea level fluctuations in the past two million years, as ice ages have come and gone, lowering and then raising sea level over intervals of time as short as several thousand years, without significant extinctions occurring. Most shelf organisms, though they may perish themselves, produce lots of offspring, which presumably could have kept pace with the comings and goings of the waters. Geologists use numerous lines of evidence to help decide how sea level has changed over time. Patterns of sedimentation and the erosion of sediments leave their traces of sea level changes. When sea level drops, portions of the continental shelf which were previously underwater become exposed. These areas may then develop coastal features including beaches, lagoons, or tidal marshes, while former beaches, lagoons or tidal marshes are left higher and usually drier, developing more inland characteristics like soils and greater vegetative cover. The remains of such changes can be seen in the rock record, together with evidence of streams cutting into the exposed shelf to reach a lower sea level. These incised channels provide clear indications of regression, and when and if sea level again rises, they fill with sediments from farther inland. The former channels, subsequently filled, are evidence of transgressions. If sea level stays stable for a period of time, wave action will tend to smooth and flatten the near-shore topography. If a regression then occurs, the flattened area may be exposed as a "terrace" surrounded by more rugged topography above and below. Such terraces are common along the coast of northern California. Some indicators of transgression or regression are as fascinating as they are unexpected. Years ago, I was exploring the rich tide pools of the Oregon coast with my children. We discovered large numbers of sea urchins, which use their long spines to cut hemispherical holes -- almost small caves -- into the sandstone for homes. Because these holes are somewhat more spacious inside than they are at their entrances, the urchins can remain wedged and secure from the pounding waves when the tide returns. The presence of dozens of sea urchins in these homes in each tide pool inspired my daughter to label them multi-family dwellings. But higher up the beach, where the tide does not reach, there are rocks with pock marks similar to those occupied by the sea urchins. Being above water level, no urchins currently live here. Moreover, these pock marks are considerably eroded. What was the explanation for these structures which looked as if they could have once been sea urchin homes? Had they indeed ever housed sea urchins? Could they just be natural cavities in the rock? A few years later came the answer: yes, they presumably were former urchin homes, because the entire coast of northern California, Oregon, Washington and southern British Columbia has been rising as a consequence of offshore plate tectonic activity. As the coast rises, relative sea level has been dropping, leaving behind the evidence of regression in the form of abandoned sea urchin lodgings. It should be emphasized, however, that finding evidence for transgression or regression at a particular location reveals nothing about global sea level. When seafloor is subducting beneath a continent, as in Oregon, it will elevate that continental coast, making it look as if there has been a regression when in fact there may have been no real change in global sea level. When major earthquakes occur on the subduction zone, as they frequently do, the continental coast often drops, causing a local transgression. Determining whether apparent sea level changes in the past were due to real changes in the level of the sea (eustatic changes) as opposed to changes in coastal elevation, particularly along what in the past were active continental margins, is a task which continues to occupy the attention of many geologists. Several studies have indicated that the Late Permian to Early Triassic ocean was partially or even significantly anoxic. The precise dating of the onset of this anoxia, however, has been the subject of continuing debate. According to some scenarios, this oceanic anoxia considerably preceded the Permian-Triassic boundary, and was a characteristic of the Late Permian ocean. In others, the anoxia constituted the cause of the end-Permian extinction. Anoxia as a cause of the end-Permian extinction was first proposed by Arthur Hallam in 1989 and by Paul Wignall in 1990 (Wignall and Twitchett, 2002). In these scenarios, the waters of an anoxic deep ocean were carried by a major transgression onto the continental shelves, where they produced the extinction. Wignall and Richard Twitchett (1996) elaborated on the oceanic anoxia proposal based on their findings of Late Permian anoxia in Spitzbergen (also called Svalbard; these are islands north of Norway, and well above the Arctic Circle) and Italy and Slovenia. In Spitzbergen they found that the Permian-Triassic boundary marked a transition from a "cherty, silty mudstone" (at the Latest Permian) to a shale at the base of the Triassic. The boundary section is part of a rock formation which was laid down on the outer part of a continental shelf. The shale is finely laminated (as shales are), indicating a lack of bioturbation, and contains such additional indicators of anoxia as framboidal pyrite (microscopic and frequently spherical clusters of pyrite grains) and unscavenged fish remains. 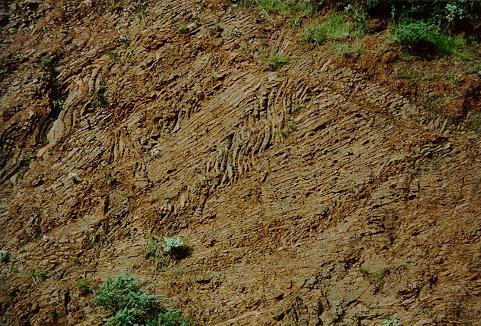 The burrows excavated by organisms such as worms and mollusks in the underlying (Permian) mudstone are missing from the overlying shale. In total, the Spitzbergen boundary section records an 80 meter (yard) thick interval of sedimentary anoxia (Wignall and Twitchett, 1996). Rock formations in northern Italy and Slovenia reveal similar boundary section anoxia. There the overlying rocks are largely composed of micrite (solidified brown calcium carbonate mud), but this micrite is laminated, and thus indicates a lack of bioturbating organisms. This is in contrast to the underlying rocks (from prior to the anoxia), which contain calcareous algae, brachiopods, echinoderms, and foraminifera. In addition, the underlying sediments contain no detectable uranium, indicating that this portion of the continental shelf was then well-oxygenated, whereas the overlying sediments reveal uranium enrichment, a consequence of anoxic conditions. Most of this boundary section originally lay in shallow water, above the level stirred by major storms. This confirms that even shallow waters were subject to the pervasive anoxia, though it seems (as would be expected) that occasional storms were able to churn the sea surface sufficiently to transport oxygen to the continental shelf floor. Wignall and Twitchett (1996) specified three requirements for anoxia to have been responsible for the end-Permian extinction. First, the anoxia must have been widespread. Clearly, their own work and that of others such as Isozaki (1994, 1997) confirmed both that the anoxia was geographically widespread, affecting equatorial, mid-latitude and high-latitude waters, and that it was not confined to particular ocean depths. Second, this anoxia "must have affected areas of unusually shallow water, the repository of most marine invertebrate diversity." Again, their own work helped confirm such anoxia high in the water column, although surface waters may have only dysoxic (mildly anoxic) or transiently oxic. Third, there must be a close temporal and spacial relation between the anoxia and extinction. Several studies, including their own, have confirmed this connection. The authors did note that other investigators detected a "rapid negative carbon isotope shift" in Permian-Triassic boundary sections, but they attributed this to a drop in productivity -- by definition, an attribute of an extinction event. Nonetheless, they obviously believed -- and provided substantial evidence -- that marine anoxia was the cause of the end-Permian extinctions in the oceanic realm. But they provided no explanation for the extensive terrestrial extinctions, and did not suggest how these could have been related to those in the ocean. Having noted that an oceanic temperature rise would have simultaneously increased the oxygen uptake of aerobic marine organisms while decreasing the amount of oxygen dissolved in the ocean, Wignall and Twitchett nonetheless rejected the idea that a temperature change alone would have caused the extinction. Rather, they believed that "Probably the single most important cause of oxygen-deficient waters (and thus the marine extinction) was the decline in oceanic circulation as the equator-to-pole temperature gradient declined" (Wignall and Twitchett , 1996). The same year as Wignall and Twitchett published their detailed evidence for end-Permian anoxia, Andrew Knoll and his co-authors (1996) laid out a suggestion for its cause, though their timing was quite different. Knoll drew heavily on the similarities he and his coworkers saw between the Late Proterozoic (one billion to 543 million years ago) ice ages and events of the end-Permian. Like the Late Permian, the Late Proterozoic was a time of continental aggregation: the Late Proterozoic megacontinent is referred to as Rodinia. Like the Late Permian, the Late Proterozoic was a time -- at least initially -- of relative global warmth. No continental ice sheets were present. According to Knoll, these Late Permian conditions would have led to sluggish ocean circulation and a diminished transport of oxygenated water to the deep sea, causing dysoxia and perhaps anoxia. Like today, phytoplankton photosynthesis near the sea surface would have drawn carbon dioxide from the atmosphere and, having incorporated it into organic matter, released that matter into the deeper ocean. Under conditions of diminished oxygen in the ocean, however, most of this organic matter would not have decomposed. Some of the organic matter would have reached the seafloor and been incorporated in sediments; the rest would have been consumed by sulfate-reducing organisms, producing high concentrations of bicarbonate (HCO^3­), hydrogen sulfide (H¸2S), and carbon dioxide (CO¸2) in the ocean deep. Because the plankton preferentially employs the lighter isotope of carbon (^12C) in photosynthesis, the organic matter, bicarbonate, and carbon dioxide would all have exhibited negative carbon isotopic (d^13C) shifts (Knoll, 1996). Eventually the atmosphere would have become sufficiently depleted in carbon dioxide that global cooling and the formation of continental ice sheets would have ensued. This would have restored vigorous thermohaline circulation, causing oceanic turnover and the rapid release of bicarbonate- and carbon dioxide-enriched waters from the deep. The sudden carbon dioxide release would have biologically compromised or even suffocated aerobic marine organisms, causing the extinction. The negative bicarbonate ions would have combined with the abundant positive calcium ions, and caused the precipitation of "anomalous carbonates" (Grotzinger and Knoll, 1995). The carbon dioxide would have entered the atmosphere, producing global warming and melting the continental glaciers (Knoll, 1996). The "anomalous carbonates" noted in many rocks from the Permian-Triassic boundary worldwide are called aragonite fans. They once were composed of the mineral aragonite, though the aragonite has typically been replaced by calcite. Both of these minerals are composed of calcium carbonate (CaCO¸3); they form under different geochemical conditions and their crystals are quite distinct. While they are referred to as fans from their two-dimensional appearance, in three dimensions they most probably originally resembled hedgehogs or the splayed bristles of an old shaving brush. Aragonite hedgehog may therefore be a more descriptive moniker. Specimens from the Permian-Triassic boundary range in size from smaller than 2 millimeters (less than an eighth of an inch) to at least 20 centimeters (8 inches) across. When this Proterozoic scenario is applied to the end-Permian world, according to Knoll, it explains many of that world's main features: the negative carbon isotope shift, the "anomalous carbonates," and a purported "brief episode" of northern sea ice formation and glaciation. In addition, it explains why the extinctions in the marine realm seem to have more selectively impacted organisms with heavily calcified skeletons, weak circulatory systems, and low metabolic rates. All of these attributes would have made these organisms particularly vulnerable to higher ambient levels of carbon dioxide, a condition known as hypocapnia (Knoll, 1996). The differences between the Wignall and Twitchett (1996) and Knoll (1996) anoxia proposals deserve elaboration. Athough both proposals suggested oceanic anoxia as the cause of marine extinctions, Wignall and Twitchett focused on the lack of oxygen while Knoll and his colleagues believed that it was the heightened presence of carbon dioxide which was the actual extinction cause. More importantly, Wignall and Twitchett envisioned ocean anoxia as having begun near or at the Permian-Triassic boundary, and as continuing into the Early Triassic. Prior to that time, the ocean was presumably well-ventilated. Knoll, however, saw the oceanic anoxia as having built up over a long peiod of time (presumably millions of years) during the later Permian, sequestering carbon dioxide in the depths of a stratified ocean. During this time the Earth cooled and glaciation increased, but a sudden flood of meltwater at the end of the Permian would have overturned the ocean, releasing its carbon dioxide and causing the extinction. Thereafter, presumably, the ocean would have at least temporarily been well-ventilated. According to Wignall and Twitchett, therefore, oceanic anoxia occurred at or near the end of the Permian and continued for some time thereafter, whereas Knoll saw marine stratification and anoxia as having been increasing up to the end of the Permian, when a cathartic overturn event caused the extinction but in the process restored the well-ventilated ocean. Wignall and Twitchett (2002) noted that their proposal accounts for the observed sequence of events: oxic conditions first, followed by anoxia, whereas Knoll's has them reversed: anoxia first, then the restoration of oxic conditions. The publication of the Knoll scenario brought immediate responses. One objection (Caldeira, 1996) was that the redistribution of carbon isotopes suggested by Knoll was insufficient to account for the negative excursion seen in the carbon isotope record. A second (Vermeij and Dorritie, 1996) was that the release of methane from "adjacent high-latitude permafrost and continental shelves," rather than the release of isotopically depleted carbon dioxide from a stagnant ocean, could account for the observed negative excursion. Interestingly, Knoll and his co-author Richard Bambach (1996) replied to this observation with a discussion of the amount of methane hydrate locked in permafrost -- but completely ignored the vastly greater amounts found in the continental margins. A third response (Martin, 1996) challenged the idea that a stagnant ocean could deliver to the sea surface the level of nutrients -- particularly phosphorus -- needed for the high level of productivity postulated by Knoll. This issue was later taken up by others (see below). In addition, one of Knoll's own citations in support of his scenario seems to undercut it. As with the Late Proterozoic ice ages that Knoll sees as offering precedent for his end-Permian scenario, Knoll's proposal states that the stagnant ocean drew down atmospheric carbon dioxide, cooling the planet, and producing a transient ice age. But his source (Epshteyn, 1981) indicates that this continental edge glaciation occurred between four and eight million years prior to the end of the Permian. Therefore, the observed cooling and limited glaciation cannot be the cause of Knoll's proposed oceanic overturn. The Knoll scenario was also challenged by Roberta Hotinski and her co-authors in 2001. They did so based on their modeling of ocean circulation, using one of the standard general circulation models (GCMs). The modeling employed two sets of equator-pole sea surface temperature gradients. In the first case, a high temperature gradient between equatorial and polar waters (the total temperature difference was about 28°C in the northern hemisphere, and about 35°C in the southern hemisphere; or 50°F and 63°F respectively) was used. This is similar to the temperature gradient in the modern ocean, but this model set incorporated the high levels of atmospheric carbon dioxide presumed for the Permian. The gradient failed to exhibit anoxic conditions in ocean bottom waters. According to the results from the second case -- the "reduced [temperature] gradient model" -- relatively strong ventilation (oxygenation) of the deep ocean is still possible, and anoxic conditions, when they appear, are likely to be transient. With the deep ocean close to but not fully anoxic, only a relatively high level of marine productivity could push the system toward complete anoxia. But because of the sluggish circulation indicated by this model, oceanic nutrient levels are reduced, and marine organisms suffer reduced productivity and create less organic debris. With less organic carbon entering to the water column, not all of the remaining oceanic oxygen is used by aerobic organisms for decomposition. Oxygen thus remains in the water column. The element phosphorus (rather than carbon or oxygen itself!) turns out to be key to understanding why sea surface productivity can become more restricted. Phosphorus is an essential nutrient for living things, and its relative scarcity makes it a "limiting nutrient" for biological activity. In the oceans, phosphorus is usually made available either by delivery from terrestrial rivers, or by the upwelling of nutrients from the ocean floor. With reduced oceanic circulation, Hotinski presumed, there would be less upwelling, and therefore less available phosphorus for biological activity. In fact, Hotinski (2001) asserted, five times more phosphate (compounds containing phosphorus and oxygen) would have been necessary in the end-Permian ocean to provide the additional productivity required by Knoll for his anoxic ocean scenario. Other scientists (Van Cappellen and Ingall, 1994, for example), however, have argued that increased oceanic anoxia results in a decreased sedimentary burial of phosphorus, and that decreased thermohaline circulation or decreased oxygen downwelling therefore produces increased sea surface productivity. On the other hand, the discovery that large sulfur bacteria (which live in anoxic or at least dysoxic conditions) acquire and dump phosphate is probably good evidence that Hotinski is correct (Schulz and Schulz, 2005). But Hotinski did not examine two additional factors that would have enhanced end-Permian oceanic anoxia. First, the Siberian Traps eruptions would have added enormous amounts of volcanic ash -- and therefore nutrients -- to the oceans. With pyroclastic explosions constituting about 20% of the eruptive sequence, huge quantities of ash would have been ejected. Even if only 10% of this ejecta reached the ocean (and a portion of that which did not reach it directly would have eventually been transported there because of erosion), that would still constitute a minimum of about 40,000 cubic kilometers (8600 cubic miles) of ash. With phosphate (PO¸4^­3) accounting for about 0.1 to 0.7% of volcanic output (and, more likely, between about 0.1 to 0.2 or 0.3%; McBirney, 1993), the minimum amount of phosphate that would have entered the ocean directly and immediately as a consequence of the Traps volcanic ashfall would have been equivalent to about 40 cubic kilometers (8.6 cubic miles). But phosphate fertilization may have only enhanced phytoplankton productivity only transiently: the increased oceanic warmth and acidity could have compromised the phytoplankton in the longer term, even driving some to extinction. This amount of phosphate would certainly have increased sea surface organic productivity. In addition, increased sea surface productivity and/or reduced equator-pole temperature gradient would have not been the only reason for the diminished oxygen of the end-Permian deep ocean. The release of seafloor methane would also have drawn down marine oxygen, as that methane made its way up through the water column. And there would likely have been plenty of methane available, even after significantly depleting the water column of oxygen, to slightly draw down atmospheric oxygen as well. It seems clear that the events of the end of the Permian resulted in an anoxic deep ocean, although that ocean may have already been somewhat depleted of oxygen even as the Permian moved toward its close. The anoxia was long-lasting, as shown by the work of Isozaki (1994; 1997) and others. This anoxia is also likely to have affected the shallow ocean, although perhaps only partially (therefore producing dysoxia) and transiently. Knoll's oceanic overturn scenario, however, does not seem to have proven convincing to many scientists. Knoll's careful work in identifying the particular marine victims of the extinction does point to the involvement of carbon dioxide. But whether that carbon dioxide was released from a stagnant deep ocean appears doubtful. Instead, the notion that seafloor methane was the main causative agent -- with carbon dioxide a consequence of methane oxidation -- seems to be gaining in acceptance.